The earliest known inhabitants of the area were the Yamhill Indians, who have inhabited the area for more than 8,000 years. They were one of the tribes incorporated into the Confederated Tribes of the Grand Ronde. In 1857, they were forced to migrate to the Grand Ronde Reservation, created in Oregon's Coast Range two years earlier. The earliest non-native settlers were employees of various fur companies, who started settling in Oregon around 1814. But it was the establishment of the Oregon Trail that led to significant migration to the area. Yamhill District (later county) was created in July 5, 1843, five years before the Oregon Territory was established. It was one of the original four districts created by Oregon's first Provisional Legislature, along with Twality (later Washington), Clackamas, and Champooick (later Marion) counties. The Yamhill district was originally more than 12,000 square miles, an area that was broken up into 12 present-day counties. 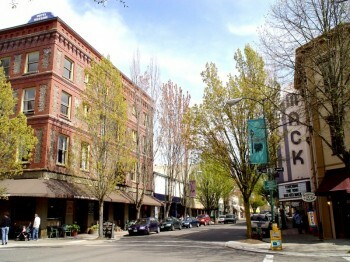 Lafayette, the principal trading center of the western Willamette Valley in early Oregon history, was made the county seat in 1847. The county seat was moved to McMinnville in 1889, where it remains today. The Mount Hebo Air Force Station was a Cold War air defense installation from 1956 to 1980. Located adjacent to Tillamook County, at the top of 3,154-foot Mount Hebo, Air Force radars operated by the 689th Radar Squadron and the 14th Missile Warning Squadron were essential parts of the nation's integrated air defenses. The large radomes protecting the radars from adverse weather effects could be seen silhouetted against the sky from many parts of Yamhill County. Amity is located on Highway 99W, south of McMinnville. The community was established between 1848 and 1849 by Joseph and Ahio S. Watt, two brothers who had immigrated to Oregon over the Oregon Trail. Part of Joseph’s land claim became the community’s townsite. The name Amity came from the name of a school that was built by two rival communities after the amicable settlement of a dispute. Ahio, the first teacher, named the school. Joseph established the first woolen mill in Oregon, and in 1868 shipped wheat to England in the first instance of Oregon wheat being sent around Cape Horn. The community was incorporated by the Oregon Legislative Assembly on October 19, 1880, originally as a town. Carlton is located on Highway 47, north of McMinnville. The origins of Carlton's name are somewhat in dispute. An ex-county commissioner claims that the name was derived from Wilson Carl, whereas A. E. Bones, postmaster in Carlton, stated in a 1925 letter that it was named for John Carl Sr., at the request of R. R. Thompson. These men may have been part of the same family. Dayton is located off Highway 18, east of McMinnville. The city was founded in 1850 by Andrew Smith and Joel Palmer. Palmer, who also served as superintendent of Indian affairs for Oregon, built a flour mill there. Dayton was named for Smith's hometown, Dayton, Ohio. The Dayton Post Office was established in 1851. Dundee is located on Highway 99W, north of McMinnville and between Lafayette and Newberg. The city was named in honor of the birthplace of William Reid of Dundee, Scotland. Reid came to Oregon in 1874 to establish the Oregonian Railroad Company, and made several extensions to the railroad in the western Willamette Valley. The first post office in the area was Ekins, established in 1881. The Ekins Post Office was closed in 1885 and a new office opened in 1887, named Dundee Junction. The name was derived from plans to build a bridge across the Willamette River for the railroad, which would have called for a junction at Dundee between the west railroad and the new east railroad. The bridge was never built. Lafayette is located on Highway 99W, north of McMinnville.#It was founded in 1846 by Joel Perkins, who named it for Lafayette, Indiana. The city was incorporated by the Oregon Legislative Assembly on October 17, 1878. Lafayette was the county seat of Yamhill County from its founding until 1889, when county residents voted to move the county seat to McMinnville. McMinnville is located southwest of Portland. Highway 99W slices its way through town to the north and south. Highway 18 bypasses the community to the east and west. This charming turn-of-the century city owes its beginnings to William T. Newby of McMinnville, Tenn., who came west during the Great Migration of 1843. He arrived in Oregon on the first wagon train. In 1853, Newby erected a gristmill at the west end of Third Street, below the present city library. Construction of this mill was the primary reason for the early growth of the city. McMinnville was a thriving agricultural center in the early days. By 1866, it was described as the most flourishing village in the county. It had 300 residents, five stores, three blacksmith shops, two wagon shops, one photographic artist, one silversmith, one shoe shop, two doctors, two churches, one flour mill and no licensed beer or grog saloons. In 1876, residents incorporated McMinnville as a town. Then, in 1882, the citizens again incorporated McMinnville — this time as a city. After a heavy campaign by the McMinnville citizenry, county residents voted in 1886 to change the county seat to McMinnville from Lafayette, where it has remained ever since. Between the years 1885 and 1912, most of the historic Third Street business structures were built. Many of the buildings from that era are still intact. Today, McMinnville continues to expand its amenities, while remaining sensitive to its history and the buildings associated with its past. Newberg is located on Highway 99W, north of McMinnville. Incorporated in 1889, tradition holds that this town was named by its first postmaster, Sebastian Brutscher, for his former hometown of Neuberg, Germany. One of the current streets, Brutscher, is named after him. Newberg was the first community in Oregon to hold Quaker services. It was incorporated as a city in 1889. Pacific Academy, later renamed George Fox University, was founded by the Quakers in 1891. George Fox University is the only evangelical Christian university in the Pacific Northwest classified by U.S. News & World Report as a national university. The campus resides in the center of the city, surrounded by university-owned housing. President Herbert Hoover moved to the city in 1885 at the age of 9 to live with his uncle after the death of his parents. The home has been turned into the Hoover-Minthorn House museum. The town was "dry", meaning no alcohol could be sold within the city limits, for a good part of its early history. Although alcohol is now allowed within city limits, and George Fox University professors and graduate students have been given a little more freedom with alcohol consumption, the university's undergraduate population is still expected to abstain. In 2005, the Dundee City Council voted to disband its police department and contract services to the Newberg Police Department. After the Newberg City Council approved the contract the department was renamed the Newberg-Dundee Police Department. Each town still has its own fire department. Sheridan is located off Highway 18, southwest of McMinnville. Platted in the 1860s when it received a post office, the city was incorporated in 1880 and named in honor of the American Civil War general Philip Henry Sheridan. A major fire burned much of the city in 1913, and a flood covered much of the city in 1964. Located along the South Yamhill River, the city is at the base of the Northern Oregon Coast Range, west of the county seat of McMinnville along Highway 18. This highway, along with the 18 business route that connects neighboring Willamina to the west, runs east-west through Sheridan along with the river. The Sheridan Bridge the only bridge crossing the river in town. One of the largest area employers is the Federal Correctional Institution, a federal minimum and medium security prison. Willamina is located off Highway 18, west of Sheridan. The year was 1879 when a pioneer woman fell off her horse into a swift river. The river and the town still bear her name. That “get back on your horse” pioneer spirit is alive and well in Willamina. Having faced many challenges, the community perseveres. Pioneer Willamina Maley, the horse rider, and her husband founded in 1845. Willamina was incorporated in 1903. Electricity and the railroad arrived in 1910, the same year a brick plant opened in town. Timber was the community's heart and blood. Willamina was "The Little Town With a Big Payroll," where 200 truckloads of prime coastal lumber rumbled daily down Main Street. The lively downtown included a department store, two hardware stores and five gas stations. The brick plant closed in 1971, and the timber industry skidded in the 1980s. Willamina reeled in an economic free fall. Businesses closed or moved. A downtown that had the appeal of a Norman Rockwell painting became a forlorn picture of faded paint, boarded-up windows and graffiti. But Willamina retained two vital mills. The Boise-Willamina veneer plant welcomes visitors to "Timbertown." The Willamina Lumber Co. is on the other end of town. The mill is owned by Portland-based Hampton Affiliates. The Federal Correction Institution in Sheridan, Spirit Mountain Casino and the Confederated Tribes of Grand Ronde are major employers. Yamhill is located on Highway 47, north of Carlton. Originally named North Yamhill, it was incorporated under that name by the Oregon Legislative Assembly on February 20, 1891.